We’ve just posted a discount code on OzBargains for $50 off tree removal. You can get $50 off your final invoice if you quote the code that is found at OzBargains. It is only valid for June and July 2018. We’d like to plug our arborist friend’s sites. These guys do top notch tree removal and are fully qualified and insured. It is important when you are planning tree removal that you use a company that you can trust. Your property matters to us. If you’re in Queensland, namely the Brisbane area, you should drop Brisbane Tree Removals a line if you’d like a professional arborist to perform some tree work for you. If you’re in New South Wales, in the Inner West of Sydney, you should say hello to Sydney Tree Removals as they provide a full range of tree services without the hefty price tag. Stump grinding is only able to be completed after a tree has been removed, leaving a tree stump. Stump grinding is when a machine, called a stump grinder, is used to remove the remaining stump which is completed by the machine using a rotating disk which gradually chips away at the stump, creating a smooth surface or ground, leaving none of the stump behind. 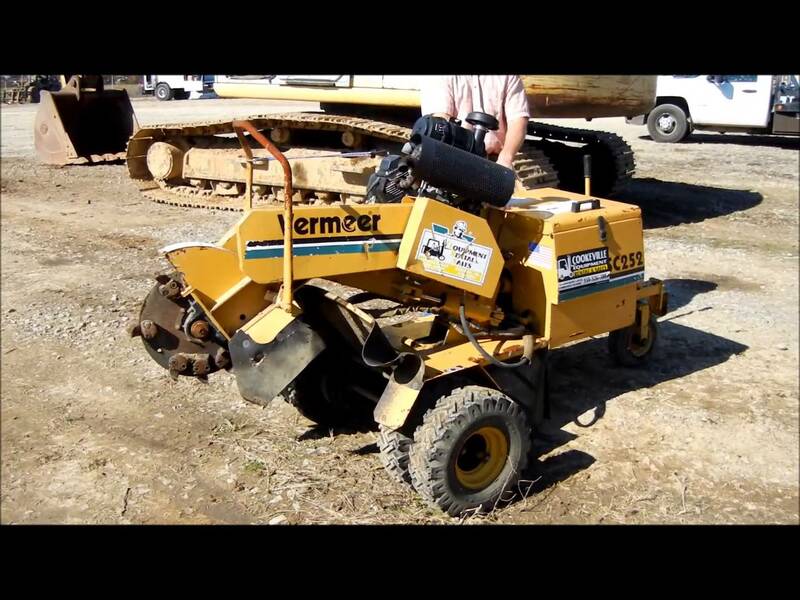 Stump grinders can range in size and shape from as big as a lawn mower to the size of a truck. There are various advantages surrounding stump grinding and its effectiveness like it’s fast, great for the garden, excellent for the environment and has minimal damage effects. Stump grinding can prove to be one of the more effective methods of removing a tree stump. Using a stump grinder is one of the fastest methods of removing a tree stump. The reason behind this is due to its powerful spinning disks which constantly chip away at the stump. Tree stump grinders eliminate many of the hassles associated with traditional methods of stump removal like having to clear the roots away and digging around the stump. All these issues are eradicated effectively with the job being completed in a shorter period of time using a stump grinder. Not only does using a stump grinder decrease the labour involved with removing a stump, but it is also excellent for the garden. Stump grinders prove to be excellent for the garden as their disks carve through the stump, creating nutritious mulch for your garden. Not only is it a great source of mulch for your garden, but it looks fantastic on your garden bed. 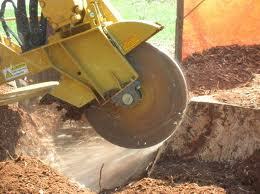 Stump grinding has had increasing popularity with environmental preservation groups. The reason surrounding this is due to the use of stump grinding in the removal of disease infected stumps. Removing these stumps will permanently prevent the further spread of these diseases between other trees, meaning stump grinding is the perfect tool for the job. Another benefit surrounding stump grinding is the minimal damage it produces when in use. The reason for there being minimal damage is due to the accuracy of the machine. The accuracy of these machines are precise and remove the stumps without damaging its surroundings which can include other trees, plants or landscaping. Stump grinding is the best method of tree removal. Stump grinding is completed in a much quicker time than traditional methods, provides better results, is great for the garden and is beneficial to the environment. 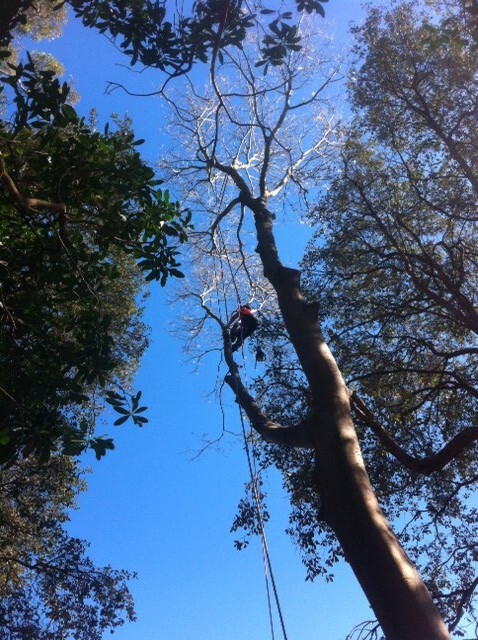 For a free quote, talk to Sydney Tree Removals. After a tree is cut down it may take many years for the roots and trucks to die. Often stumps will go on living for many years to come with new roots developed and sprouts not only appearing at the stump but in the tree’s general area. If stump removal and stump grinding is not an option for you (although they are relatively inexpensive) and you don’t feel the need to burn the stumps or use toxic chemicals, then the use of rock salts might just be for you! Have the tree lopped to as close to ground level as possible. Make sure it is safe and not a tripping hazard. 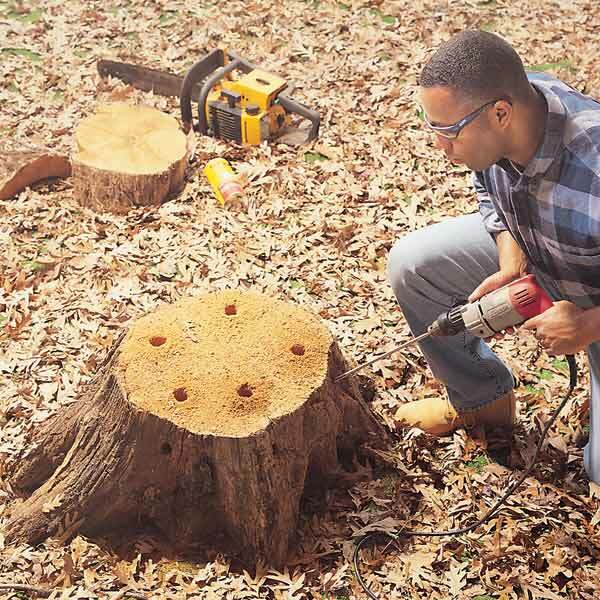 Drill holes into the side of the stump at a downward angle as close to the top of the stump as you can. Make sure the holes you drill are at least 2 cm in diameter. Drill additional holes all around the stump. The larger the stump – the more holes it will have. Fill the holes with rock salt. Compress the rock salt in using a rod. (Optional) If you are not concerned about nearby vegetation sprinkle salt around the base of the stump. Cover the stump and salt with soil. Give it a good soak with water so the salt dissolves and enters the soil. Water the stump every 2-3 days for 5-6 weeks. This helps the salt enter the stump. If you notice any growth during this period repeat the salting process. Patience is the key to success! If you’d like the stump to rot faster now that it’s dead, have a read of this organic stump removal process. Removing stumps can be a long, difficult, and exhausting task. There are many methods from digging it out, using toxic chemical, to stump grinding. Somewhere in this spectrum of tree stump removal methods there is removing the stump organically. That is, removing the stump using natural products, methods and allowing Mother Nature to do all the hard work. 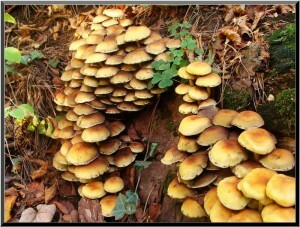 This article focuses on using mushrooms to speed up the process of decomposition. There are plenty of other organic stump removal methods, this is just one. Before I begin – organic stump removal isn’t for everyone. It should be used for people who don’t require the stump removed immediately, have limited funds or have an organic philosophy to life. Stumps are massive. They take several years to decompose unaided. So if that stump is going to be around you might want to make the most of it and get some edible mushrooms out of it… right? Tasty gourmet mushrooms are natural stump removers. They break down the stump while producing a wonderful supply for your gourmet dinners. Mushrooms can halve the time it takes for a stump to be fully decomposed. Before you start a word of caution – you need to be able to identify the difference between poisonous and edible mushrooms. Just because you plant edible mushrooms doesn’t mean that a poisonous species hasn’t beat you there and has started growing first. You need to be able to correctly identify the mushroom you intend to eat, mistakes can be fatal. You’ll need to pick a suitable mushroom for the job. Mushrooms like shiitake and oyster grow very well on logs but are not suited for growing on stumps. Stumps are a highly competitive environment and you need to use a mushroom variety that can handle competition. There are some mushrooms that are stump specialists so you may want to consider these; agrocybe aegerite (black popular mushroom), hypholoma sublateritium (brick top mushroom), grifola frondosa (maitake), laetiporus sulphureus (chicken-of-the-woods mushroom), trametes versicolour (turkey tail mushroom). I will leave it to you to do your research and decide what is best suited for your environment and taste buds. The method is actually quite simple. You need to inoculate the stump with mushroom plug spawn. This is a small wooden down that has the particular mushroom that you were looking to grow on it. Drill a hole in the log or root and then hammer that dowel in, making sure to seal the hole with wax upon completion. Obviously, the more plugs you put in the better. You can space them at around 2-3 centimeters apart. If you don’t have access to a plug spawn you could alternatively use sawdust spawn in the holes. It is harder to protect, but well worth the effort. The Celtis tree is also known as Hackberry or Sugarberry has migrated from the Northern hemisphere and is appearing in garden beds around Sydney. This tree produces thousands of seeds which are spread by birds and before you know it you have a large tree in your backyard which requires an arborist to remove. Keep watch of them growing in your garden beds because both the tree and their stumps are very difficult to remove. Shown is a picture of a 30 m tall Celtis tree which was growing out of a garden bed in Lindfield. The tree was growing out and over the neighbours pool, I’m sure the neighbour was happy the tree was removed. Stump grinding is possibly the most effective method of removing the remnants of a tree stump from a garden, plot or landscape. By default arborists only remove the tree to the ground level. Usually, a tree is lopped to the lowest possible point that cutting equipment can operate at without being damaged by being run into the dirt or concrete. This means that a small section of the tree truck may stick up from the ground. These stumps can be unsightly and a tripping hazard. They are also subject to disease which may run the risk of spreading into nearby plants and trees in the nearby area. Stump grinding allows for a complete removal of stumps that not only eliminates potential hazards, but also creates an opportunity for new plants and garden beds. This is an interesting video that shows how to remove a tree stump using a tractor. Well, they use an excavator attachment on the tractor but that is besides the point. If you have the heavy machinery and the space to dig out a stump mechanically it is a great option. 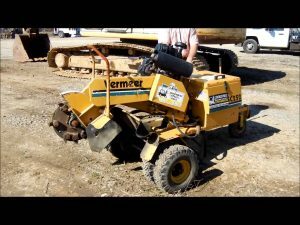 It is a more thorough alternative to stump grinding which is the more common approach, however, if you have to hire the equipment it becomes very expensive quickly. The video shows how large the root ball of the stump is and how easily the tractor can dispose of the stump. After a tree is removed, often the stump will continues to grow and there will be sprouts of growth on the stump in the few weeks after it is lopped. If left untreated then the stump could potentially regrow into another near full sized and slightly disfigured tree. Removing the tree stump is the only way to prevent the tree stump from regrowing if poisoning and kill the stump is an unacceptable option. The first thing that needs to be done is the tree must be cut to ground level, or the lowest level permitted by the terrain. Within 30 seconds of causing an injury to the stump or its roots a generous application of tree poison needs to be applied. Any delay in applying the poison may allow the tree’s cells to close up and the stump won’t accept the poison as readily. Use a chainsaw to cut grooves in the stump and roots and quickly apply the poison using an applicator or spray bottle. Drilling holes into the tree’s stump and roots is an equally effective option. There are many products on the market that would be suitable to poison a tree stump. Glyphosate based liquid poisons are highly effective (such as Round-up, glypho 450, zero, etc) when applied in this manner. Make sure they are applied in dilute form and in accordance with the manufacturer’s instructions. Wait around 6 weeks and then reapply in the same manner – making grooves in the timber before a quick application. If the poison is undiluted it will damage the cell membranes of the stump but not be absorbed by the plant which how they cause the stumps to die. A common concern with glyphosate based poison is that it is considered a nasty toxic herbicide. In fact, it is one of the least toxic herbicides and it is not soil residual. This means that in 14 days from application it would be impossible to detect in the soil as it leaves without a trace. There is zero chance that glyphosate would poison plants that it was not applied to. So don’t get over zealous with your application and accidently exposed the other plants when you were applying it. There is the risk if it rained within 6 hours of application the poison could spread – so check the weather before applying. Also, in winter trees can have greater resistance to herbicides as the tree’s growth slows during this time. For stumps that just refuse to die there are some serious heavy duty poisons available. Tordon has an injection poison, which is injected into tree stumps roots and causes rapid death. Graslan and Tordon have pellets which require drilling into the tree stump and inserting the pellets that get slowly absorbed. There are basal bark forms from Access, Garlon 600, and Starane which are also highly effective for those hard to kill stumps. We suggest using a glyphosate poison, but if it isn’t working then try the cut stump method with any product from Access, Garlon 600, Tardon, and Starane – they are guaranteed to do the trick. If you can’t be bothered with poisoning your stump you could always get a professional arborist to come around and poison or remove the stump for you. Try the crew at Sydney Tree Removals as they are highly affordable and have an excellent reputation. *The drill holes in the picture are incorrect, the ideal place to drill is just into the cambium layer which is just inside the bark. Stump grinding is an inexpensive and efficient way to remove tree stumps. Approximate prices in many cases can be provided over the phone so call now on 0488 222 296. Alternatively an excavator or backhoe can dig the stump and root ball out. This may be an option where increased depth is required or roots need to be extracted. The disadvantage to this option is that it can be costly and leave a large hole that needs to be filled. There are also significant costs in the disposal of the stump or root ball. While we take care and assess each situation but we accept no responsibility for damage to underground services. Services like Dial Before You Dig provide and council records provide excellent references for to help identify services in your area. However, these can be imprecise and the providers accept no responsibility for the information provided. If you are unsure about services in your area then it could be in your interest to engage a pipe or service location business who can help locate the services as well as their approximate depths.